It was a sewing kit. They had little pockets to put their sinew in. You had your ivory needles, and then your thread, whale sinew…The ladies, they would take it along just like a handbag so they would always have their sewing with them…My mother and my godmother, they used to carry them. 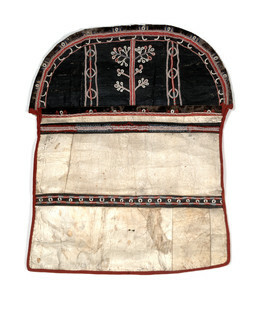 Women carried roll-up pouches to hold their sewing supplies, and a nicely made kakiwik demonstrated the owner’s artistry. This sewing bag has a black-painted flap, sealskin trim, dyed-esophagus strip appliqué, caribou hair embroidery, and rows of tiny yarn loops. A sinew cord wraps around the bag when rolled. The pouch would have held needles—traditionally made of split bird bone, ivory, or copper—as well as scraps of fur and thread made from whale or caribou sinew. Cindy Pennington: This [a different type] is made out of birch bark . . . and it’s woven with roots. And this was used for a sewing kit? Lucille Davis: Yeah. And they used it so they would have their iron needles and everything. That’s what they used it for. Clyda Christiansen: It was a sewing kit. Lucille Davis: You had your ivory needles, and then your thread—whale sinew . . .
Clyda Christiansen: . . . I remember that they [sewing kits] out of cloth, but made the same way. Lucille Davis: My krestnaya [godmother] had one. And my mother had one too. Clyda Christiansen: All the old people had one. They would take them with them all the time, wherever they go. . . . They had little pockets, to put their sinew thread. Later on, when I was a little girl, they used to make them with cloth, same way. And the ladies, forever, they would take it along, just like a handbag, so they would always have their sewing with them. In case they had to sew something, they’d always have it with them. My mother and my godmother, they used to always carry them. A lot of older ladies at home had them. The men had different kinds, they were smaller so they could put them in their pockets for when they go hunting. And then they were shaped [differently], and they would let them take needles. Bobby Stamp: I remember my uncle used to have one with a hummingbird, for good luck. No, I never carried one. I let the women do it. Emily Kvasnikoff: Long ago the clothes were made from animal fur and gunny sacks. . . . A gut raincoat was made of seal gut, after it was dried. . . . The gut was cut into shapes and sewn together. . . . Sinew from whale was used for thread. Needles were made from birds’ legs [bones].